Prevent holes from blocking before loading. The plugs are made of solid plastic and are available in either cone or funnel shapes. Bore hole plugs (cones) are designed for holes with a diameter ranging from 30 – 120 mm. Bore hole plugs (funnels) are designed for holes with a diameter ranging from 64 – 76 mm. Placed in mouth of the bore hole to prevent loads from sliding out. Can be used for all cartridged explosives. Solid plastic springs with powerful wings. Detent springs are available for hole diameters of 40 – 60 mm. For a hole diameter of 51 mm, are made of polystyrene and are designed to block the bore hole end in order to ensure loads stay in place in the bore holes. There are two different sizes; no.1 for bore hole diameter 38 - 51 mm and no. 2 for bore hole diameter 45 - 76 mm. Are mounted with grooves for stripping both detonator leads at the same time. The pliers also have holes in the handle for fastening chain or string. Essential for those who work a lot with electrical detonators. Special pliers for cutting black powder fuses and fastening blasting caps to these. Are a coupling clip for ExelTM and/or detonating fuse. They provide secure coupling with use of tools. 5 x 90 yellow for ‘dry work’ for example, for insolating connection points under shielding mats. 3 x 50 yellow ,for ‘wet work’. Sleeves are filled with silicone fat and provide good insulation. For example, during under-water shooting. Must have good mechanical properties and insulation resistance so that accidents and misfires are avoided. The cable has an orange colour and is delivered on plastic reels of 100 m. The conductor area is 2 x 1.5 mm2 and resistance is 2.5 W per 100 m (calculated as double wire). A cable reel has been developed for the firing cable. It is a tailored plastic spool designed specifically to make changing cable easy. Must be robust and have good insulation resistance. This has a yellow colour and is delivered in pails of 2 x 500 m. Lead diameter is 0.64 mm and resistance 5.6 W per 100 m (calculated as double wire). Orica distributes large and small mats of high quality. All mats are equipped with solid lifting straps. For smaller jobs where mats can be handled manually, Orica offers small mats of high quality and with solid lifting straps. For fastening covering materials, wire net is also delivered. 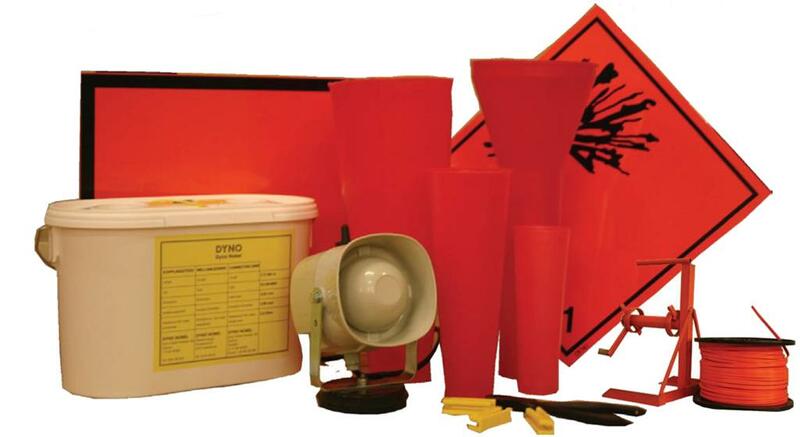 Is a practical aid for handling ExelTM-detonators on pallet.